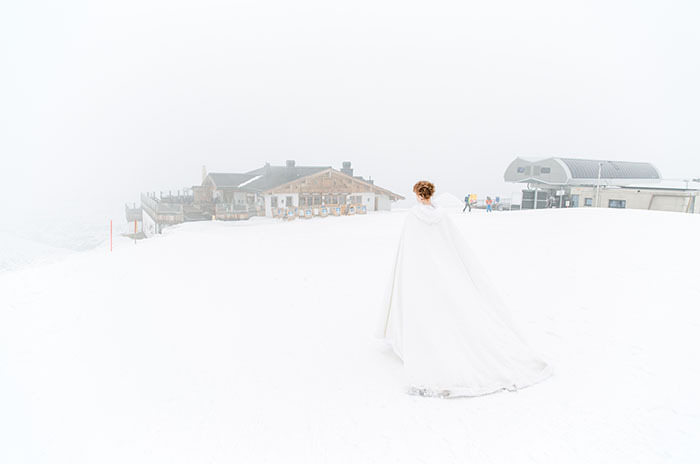 In Tyrol, it is said that a marriage held on a mountain keeps the newlyweds together forever. We like to believe this, at least as it has never been proved to the contrary. For your Big Day, we believe we have a responsibility to do everything possible to arrange a unique experience for all the wedding guests. Together we will plan the sequence of events with you, advise you on the choice of reception menus and drinks, plus the decorations, and be happy to introduce you to our selection of wedding photographers and musicians. 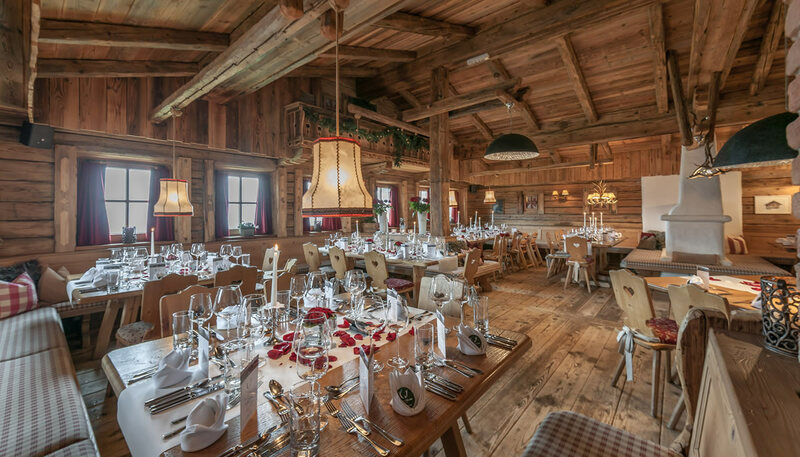 We offer you space for up to 230 guests, with disability access, your own 'wedding gondola' lift, and a sun terrace with spectacular views of 21 three thousand metre mountains. Arrange a first appointment with us, in order to confirm your ideas and our options. In the morning or in the afternoon – with the first step into the wedding gondola you will recognize that we are going to make your civil wedding a very special day. With a Piccolo Schlumberger you are going to have a gondola ride up to the Hohe Mut Alm. The ceremony will take place in our exclusive, traditional dining room “Angelus + Hans” or in the light-flooded conservatory. For your meal we offer a big variety from snacks and canapés or coffee and cake but of course we are also happy to be able to serve you a multi-course wedding menu. Another highlight is the descent with the snow groomer, which is possible in winter for up to 40 people. 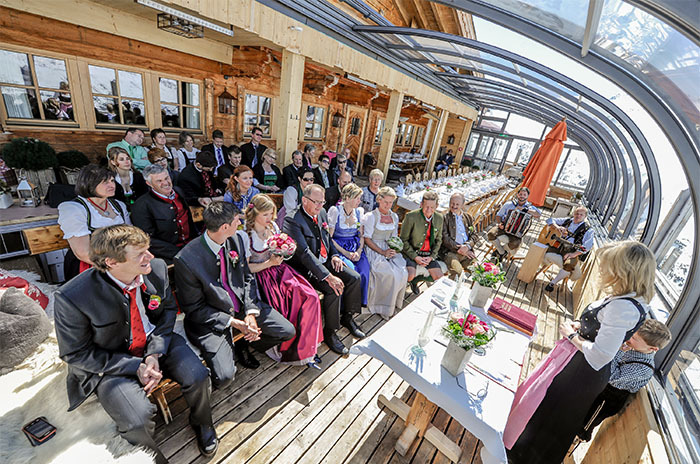 For bigger wedding societies we do also offer you to have the Hohe Mut Alm in the evening (in summer also during the day if applicable) exclusively for you. For the bridal couple a festively decorated wedding gondola is ready, what brings you with an all-round panorama to the Hohe Mut Alm at an altitude of 2.670 m. Afterwards a romantic, torch lit path leads you directly to the Hohe Mut Alm, where your celebrations start with the lighting of the open fire, and your Big Day continues with live music, an exclusive multi-course menu, or very traditionally, with a fondue.